Out of all the emails you send to your subscribers, your first few will have some of the highest open rates. It’s a HUGE opportunity to start building a strong foundation, so you should avoid the massive mistakes so many default to, especially after all the hard work you’ve already done to get the lead. Do you reach out to every lead individually and send a personal message? Do you try to educate them? Engage them? Understand them? Or do you blunder though it and end up sending the same lackluster emails everyone else does? 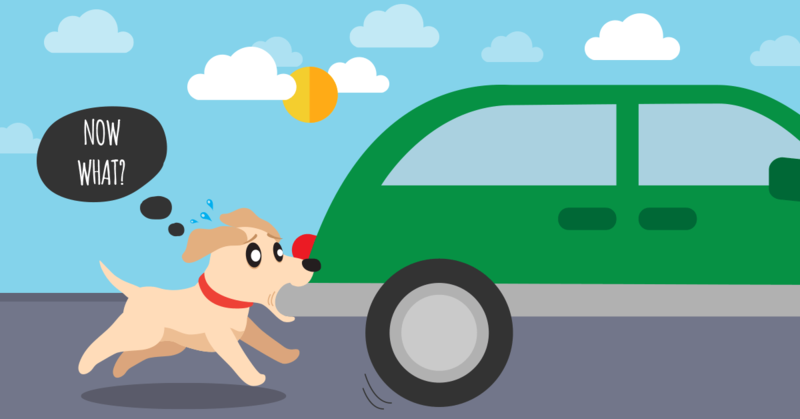 I used to live next to a family whose dog LOVED to chase cars. Without fail, he’d tear off at full speed along the fence barking at every passing vehicle. All this work to chase down and catch the car and never really thinking about what happens if the hunt is successful. The answer is different for everyone and every business, and it can get extremely sophisticated when you start diving into segmentation, data enriching, lead scoring, MQL to SQL conversions, and pitching. However, the reason why you need to put time into the follow-up isn’t. An effective follow-up is essential for more success. The more effective your first email is, the more successful you’ll be, because of how high the open rates tend to be on the first messages you send to new subscribers. Sending a mindless “here’s your free stuff” email with nothing else. A complex message trying to do it all...follow me on every social media channel, buy all my products, sign up for this webinar, this ebook, my podcast and check out this blog post. Some barely thrown together promotional/sales email in a desperate attempt to monetize the lead. No email at all, leaving the subscriber wondering if something went wrong. A well researched and personal e-mail to the new lead can have a huge impact because it shows you took the time to learn and understand them and their potential problems. It will result in more relevant and personal conversation either over the phone or email. 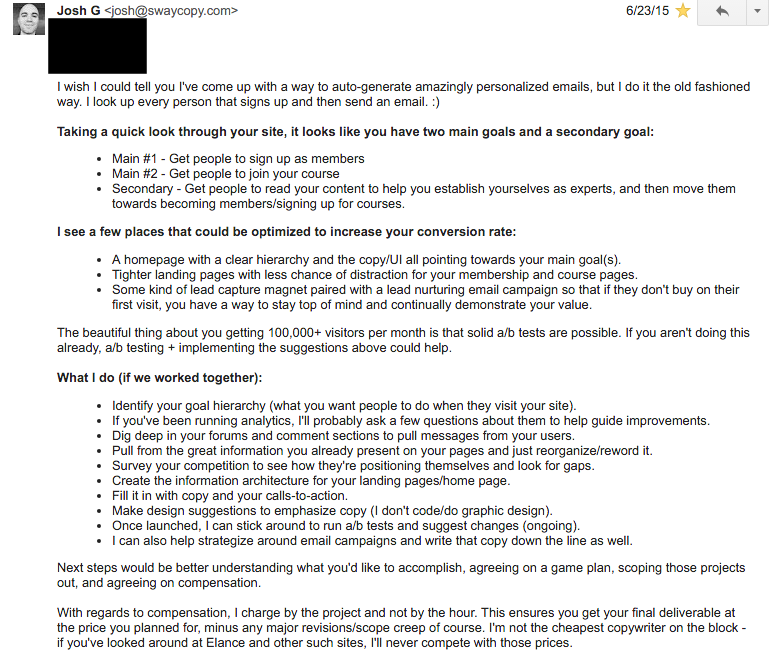 Josh Garofalo from SwayCopy personally researches and then emails every person that signs up to his mailing list with a work email. He starts it off with a short feeler email--the point here is to gauge interest, not to sell. The feeler email is meant to gauge interest, not to sell. Because he was prepared before he sent the follow-up email, he was ready to send this lengthy response on the same day if the lead expressed interest (which the lead did). This type of email takes a lot of time and effort, but the return it can provide are HUGE. Establishes credibility by demonstrating he knows what he’s talking about with precise suggestions on what he would work on. Demonstrates professionalism by showing he’s serious, moves fast with his research and can immediately provide value. Sets expectations by explaining how he sees the compensation working and why. Rapportive - Puts the Linkedin profile (and other info) of your contact inside gmail. Discover.ly - A tool to navigate your social data, making you more productive personally and professionally. Questions are irresistible, especially when it’s simple and directed at someone who’s excited about the subject. You can use this fact to try and open up a dialogue with your new subscriber. When you add this human element to your opening email and they respond, you can reply back directly. This will add a nice touch and the helpful information you provide will go a long way in turning them from a faceless reader to a raving fan more likely to share your content in the future. You can use the simple question to do more than just open a dialogue, you can use it as a way to gather information about your new subscriber to help you. Ask them what they are interested in, or why they subscribed to give you easy content ideas you know will resonate with your readers. 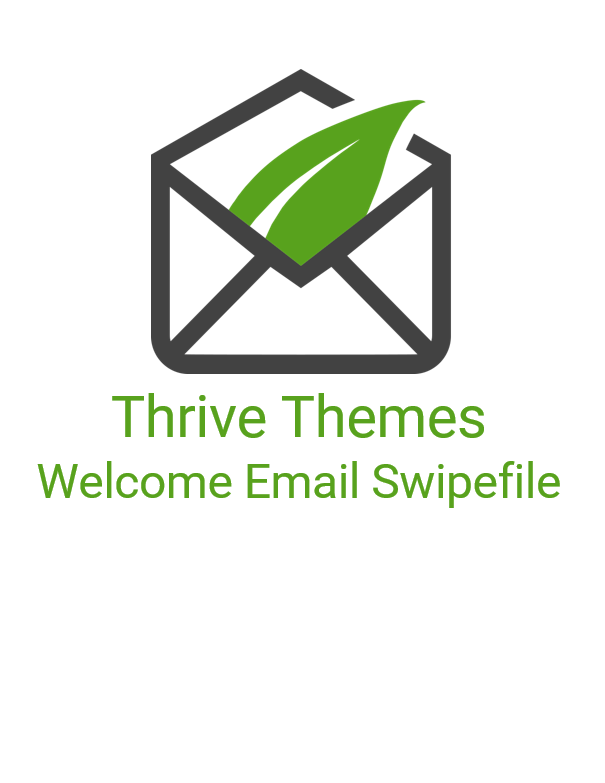 This is a technique we have used here at ThriveThemes. 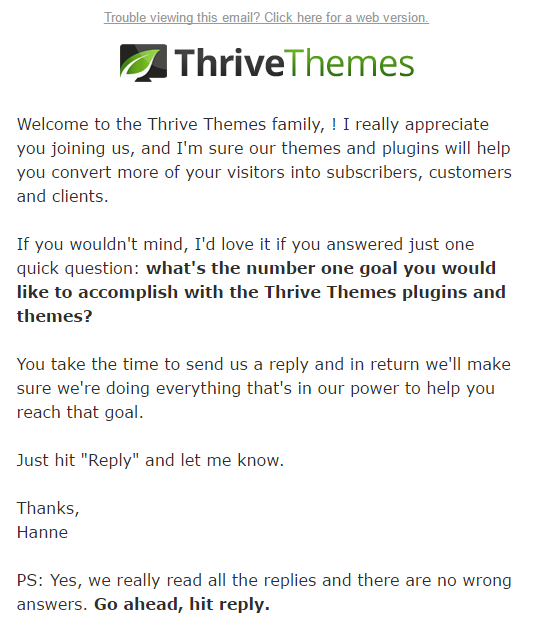 The first email to a new customer contained the question: “what’s the number one goal you would like to accomplish with the Thrive Themes plugins and themes?” It’s a good question because it’s open ended, easy to answer AND the answer will help us improve our products. Ask easy, open ended questions where the answer will help your business. Take the time to read all the responses and get back to the people who took time out of their day to reply. Analyzed the responses and then created an automated email and onboarding sequence to help accomplish the most common goals we heard from the responses. The subscriber has just finished opting in, confirming the opt-in and downloading their goodies. They have built up a momentum of following easy directions, so it’s a low resistance time to ask them to check out your other content/products, follow you on other social media accounts or help you spread the word to their friends. The key here is to make it as low resistance as possible. Any favor you ask of them should be done by a simple click of a link. Established websites with lots of content/products. Visually appealing sites with sharable social media accounts- travel, food, fashion, etc. 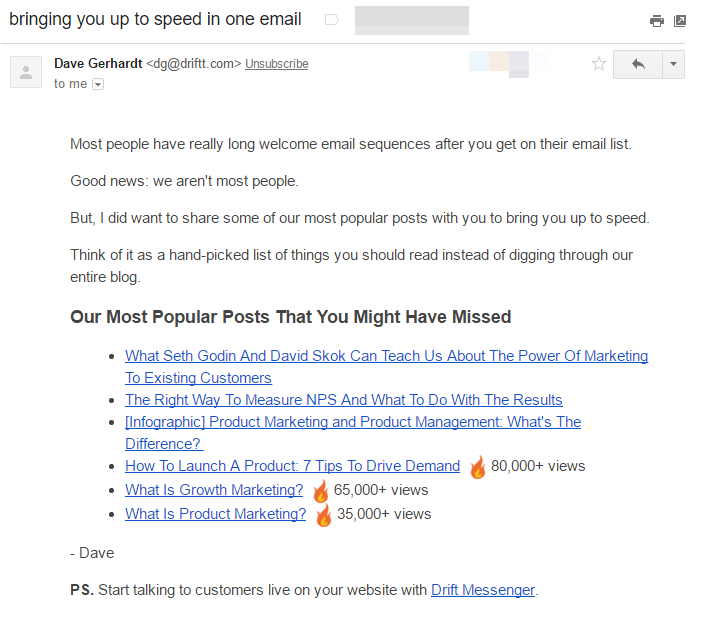 Drift uses this strategy for their first email by taking the new subscriber by the hand and making it very easy for them to get up to speed with what they are all about before ending with a link to set up the new subscriber with a free account. You have built up a momentum of following easy directions, use it to ask your new lead to do simple favors. This type of email is a great opportunity to learn more about your subscribers. For example, in ActiveCampaign, you can make a rule saying "if the reader clicks this link, add this tag", so you can actually segment readers based on what they're interested in because of the link(s) they click on. 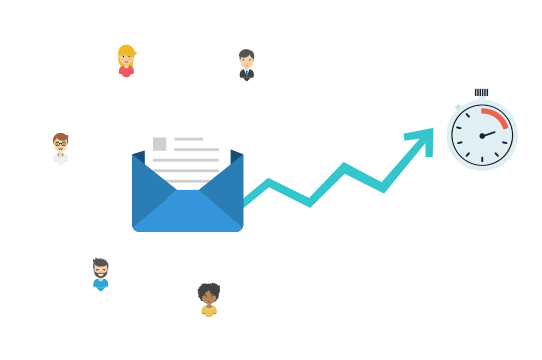 Your first email to a new subscriber will have amazingly high open rates since you are fresh in their mind, so it’s a great opportunity you shouldn’t waste. It’s easy to think just because you created content to resonate with your audience, picked the perfect opt-in form, and made a beautiful landing page your job is done. But now leads are coming in, and your job is to start turning them into fans. So your first email is no time to send a lackluster message, but rather the best time to start the new relationship out on the right foot by building a strong foundation. Every audience is different and has different expectations as well as different requirements for what will be successful with the new lead, but one thing you’ll notice from the examples above: they don’t try to accomplish too many things at once. They focused on getting the user to do one or two simple things, total. Use these examples as templates for your own first email. And if you like to learn from example or just want to see more of what the pros are doing, I've created a great resource for you. Just share this post by clicking the button below and you’ll unlock a swipefile with 10 more examples of successful welcome emails. Nicely done, Nata :) Stoked to hear you’re ahead of the game, you enjoyed the article AND that you’re <3-ing Thrive! Hello Dave, this is a great article, I agree with you. Recently, I have been testing a tool called viwomail that embed video that can plays automatically in the email inbox of the subscriber. It works with any email provider. Thanks for the great steps Dave. I see that a lot of people are sending emails after you unsubscribe from their lists, do you think that this is a good idea or no? I’ve never personally tested sending emails after someone unsubscribes so my thoughts on it are purely speculative. The reason I’ve never tested it is because I want people on my list who WANT to be there, so I’d rather focus on gathering/fostering my relationships with those people rather than trying to chase and win over someone who’s already heading out the door. However, when someone unsubscribes, it is another chance to gather information about WHY they are leaving so you can improve and try to prevent it from happening in the future. In that sense, it might not be a bad idea! Great tips Dave. All three steps are very useful and second example is the one which I will adopt to engage my subscribers. Also, you mentioned it correctly that one step at a time through email is the right way to pitch an idea or product rather than rushing in and destroying the lead. Stoked you’re already taking action and using the second example for your own subscribers. This was still a great article, Dave. Thank you for sharing. Is there any way you can change the settings on Paywithapost so I can share with a relevant crowd and still have access? Glad you enjoyed the post Michael! I set the paywithapost so you can also share on your LinkedIn network, which I’d imagine is more inline with IM (if that’s the area you’re in). Once a post is live on FB I know you can change the settings on who it’s shared with, so if you have your friends categorized as “IM friends” you could restrict the post to only be shown to them. If you have other ideas about how you’d share it with a relevant crowd, I’m all ears and would gladly give you access to the swipefile! This was rather timely. I sent out a survey yesterday and even though that is a little different I thought I’d follow the strategy and have personally responded to the few who have replied so far and added some suggestions based on their responses. Looking forward to seeing how this pans out. Glad the post was nicely timed for you, Joan! This is very helpful. But I couldn’t post it to my Facebook site. It did not work out. I tried a few times. I need help! Hey Ferdinand, sorry it’s not working for you. What happens when you click the green button? I love your Content Optin Box on viewport in this article. Hi Tom, glad to hear you’re enjoying some of the finer details of the post! In order to create the opt-in box on this page I used the “content box” element in Thrive Content Builder. The content box has an “event manager” where you can choose the animation “Animation: Appear from Center (Zoom In)” for the trigger “Comes into Viewport.” This means that the content manager will animate when the user scrolls to the position on the page. Once you have the content box in place you can customize it to show whatever you’d like: opt-in forms, buttons, pictures, etc. This is a great article, I agree with you. I have recently started doing email marketing this will be pretty useful for me. I liked the first one that is my case so I will put into practice but anyway makes total sense. I tried to download the swipefile but it didn’t work neither. Keep trying saying “Important: Ensure your post has visibility ‘PUBLIC’ or ‘FRIENDS’ – then click ‘Verify'” when I put it in those two statuses, “friends” first and then “public”. There is anyway to have it other way around? Evergreen content – time expired content upgrade. 2. Curious what the strategy is here? However, now the content upgrade is available for good! Hi Dave, great article! I hope I haven’t read over, but I would like to ask you which opening and click rates in email marketing are in your opinion good ones? Unfortunately the answer to your questions is: it depends. My suggestion is to look at your numbers and try to figure out how you can improve them as opposed to looking for numbers that others are getting because they are extremely dependent on factors out of your control: audience, niche, etc. Nice post Dave! Great examples! Great article! Love the tips from the top to bottom. The engage, ask a question tip is my favorite. I’m going to try that out and see how people respond. As far as tip #3 goes, I would argue that you don’t need to be an established blog or website to guide them through the site or hold their hand. No matter the size of the site, unless its 5 pages or less…people need hand holding. Our attention spans have depleted so any help we can give people to show them the easiest path to value is worth the time and effort. Thanks as always for sharing! You guys rock! Stoked to hear you enjoyed the article Brandon! Thanks a lot Dave for helping me out. I was trying to write welcome emails and you saved much of my time through this. While I like these examples, they seem to be geared towards people who are online business owners/employees. Can you suggest some ideas for someone who is a coach working with private clients and small groups? This content is pure UNADULTERATED GOLD!! Thanks a bunch. Great info…even though I’m “late to the party” — Still this article is still very useful, as I’m just starting out… I tried to share on FB to get the swipefile and the blue button “animated” but just kept on “ticking” and never opened anything. Is there link to the swipefile of more Welcome emails? I shared on tweeter and click on the download button but the PDF file doesn’t open. Same problem as Karen McCamy. Is it time to get more subscribers? Yes, it's time to get more leads!